then pay via debit card, credit card, or Bill Me later. If you do have a PayPal account you can still opt to pay via credit card without going through PayPal but we would advise PayPal members to use their PayPal account as that also gives you a process to resolve any grievance and your purchase is guaranteed through PayPal. Chocolates are a perishable item and we cannot replace or offer a refund on any chocolates that have melted. We transport the packages in an air conditioned vehicle, to an air conditioned post office for drop off and this is all we can do on our end to try to ensure that the chocolates to not sit in any heat. Extreme heat causes unusual consequences and we can't be held liable for any such events. We do care and we do take all pre-cautions to preserve your chocolates. 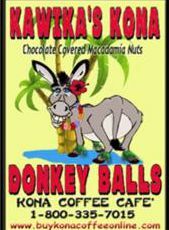 We have Gourmet Hawaiian dark chocolate and white chocolate covered macadamia nuts. 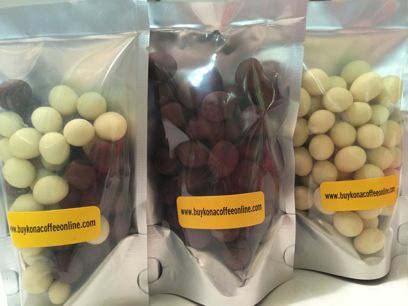 We have several varieties and flavors offered: Mixed bag of Dark and White Chocolate, Dark Chocolate, White Chocolate, Kona Coffee Flavored Chocolate Macadamia Nuts, Toasted Coconut, and Toffee Crunch. We also have plain macadamia nuts. Gourmet Hawaiian chocolate covered Peaberry Beans come in three varieties: Dark Chocolate Covered Peaberry Beans, White Chocolate Covered Peaberry Beans, and a mixed bag of Dark and White. We also have 'plain' macadamia nuts. They come in 4 ounce, 8 ounce, or 1 pound packages. ITEM 5-2 - Gourmet Hawaiian Chocolate Covered Macadamia Nuts and now dark chocolate covered pineapple center. They all come in 8 ounce bags. They come in 4 ounce bags and each are $9.95 a bag. When it comes to our business, we offer our customers a quality product and a 'no blend' kona bean coffee and we are second to none. Please feel free to ask any question through our Contact Us page.